A few months ago I found a sad looking Baby Tad by the trash. Nothing like the picture below. Imagine drooled on, stained and dragged through the dirt. I pulled it a part and threw out the material and stuffing last month at Gumbo Labs. 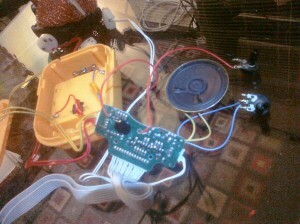 I saved the electronics parts for my first circuit bending project. I wasn’t too hopeful at this point because it didn’t turn on. In the end, it was an easy fix, the battery compartment was rusted. I used some alligator clips and started poking around trying to find something interesting. The Tad plays several kids songs. 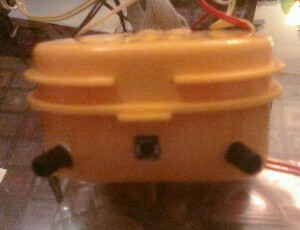 It also has a set of six colored LEDs with switches. Pressing the led triggers a new song or Tad tells you that you pressed “the blue square.” When I was poking around I killed one of the LEDs; no more blue square. I found a spot that would speed up the music. 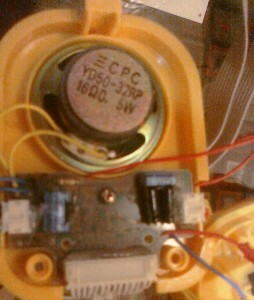 I added a potentiometer and was able to control the speed. When the songs switched, if I still had it speeding up, it would crash-out. I resolved this by adding a switch. I also added a second potentiometer to control the volume. I made some holes in the original case and mounted the switch and dials. I plan to take it a few steps further in the near future. I would love to create a new case/stuffed-animal for it, something that will match the weirdness of it.